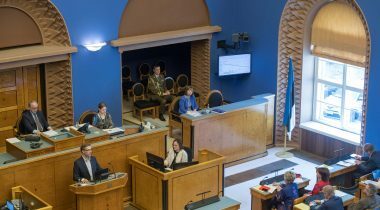 On the motion of the Constitutional Committee, the Riigikogu discussed the Estonian Human Development Report 2016/2017 as a matter of significant national importance today. The report focused on the age of migration, and emphasised segregation and dependence on migration as the main problems. Speaking of the absolute value of the human development index, Tammaru noted that it was already comparable to that of Finland. Of the new EU Member States, the value of the index was slightly bigger only Czech Republic and Slovakia. The human development index measures components relating to health, education and income. The difference of Estonia from other countries has remained the largest in income, but that, too, has clearly decreased in the course of time. Tammaru said that with rapid development, the differences inside the society also grew. “In Estonia, inequality increased rapidly in the 1990s,” he admitted, and added that in our country, the inequality had not started to diminish significantly, but had remained on this high level. Only Latvia, Lithuania and Romania have greater inequality than Estonia. Tammaru pointed out that a change in migration pattern was taking place in Estonia and the migration trends in Estonia were clearly changing. He noted that migration tends to take place from countries of lower welfare to countries with greater welfare, and therefore more and more people from outside the EU were coming to Estonia. At the same time there is still large inequality in Estonia, which makes many low wage earners leave Estonia. 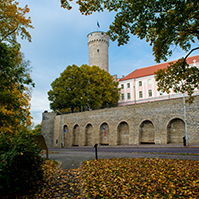 Tammaru said that after Estonia’s accession to the EU, emigration from Estonia increased, but actually the accession to the EU also laid foundation to immigration into Estonia. 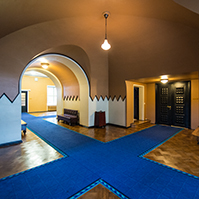 “The status of a member of the European Union and increase of welfare are the factors that have brought more and more people to Estonia,” Tammaru said, and noted that in 2015, the number of people who came to Estonia for the first time had been greater than the number of people who left Estonia, and according to the latest data of Statistics Estonia, this situation had continued also in 2016. According to him, the net migration rate of Estonia became positive immediately after the accession to the EU. Unlike many other countries, mainly high-salaried people arrive in Estonia. However, those who have not received a part of the development of Estonia, or the low wage earners, leave the country. “By today, we have reached the turning point of migration, the growth of welfare brings more and more people to us – especially from outside the EU, mostly from Russia and Ukraine, but also from various other countries of the world, from each continent,” Tammaru said. The authors of the Human Development Report claim that Estonia, with the rest of the world, is entering a new migration age, which is characterised by increase in the migration of people and change in the nature of migration. The authors state in the report that Estonia has become dependent on migration, and the problem is how to cope better in this age of migration, so that the society would not become fragmented and split. They find that the birth rate should rise to the level necessary for the reproduction of population, and that it is also necessary to have a rather extensive immigration, or around 200,000 people per year. In his report Tammaru also spoke of segregation. He said that during the last 25 years, housing segregation has grown rapidly, which means that people whose native language is Estonian and people whose native language is Russian live in different neighbourhoods also inside Tallinn. He pointed out that immigrants from the EU settled in the centre of Tallinn, for example, in the district of Kalamaja, where there were many people whose native language was Estonian. Immigrants from the CIS settle in the districts of Tallinn with panel blocks of flats, where the language environment is familiar, and there are Russian schools their children can go to. According to Tammaru, such parallel societies, which Estonia has inherited from the Soviet period, reproduce segregation relating to modern immigration of today. He explained that if there were differences on the labour market, then there would also be differences in income. If the incomes are different, people settle in different neighbourhoods. “Our schools are based on place of residence and district: children go to the school nearest to them. And thus the education and schools are segregated, and this segregation from education in its turn reaches the labour market,” he said, and remarked that the vicious circle in segregation worked in the same way also in other countries of Europe. Tammaru said in conclusion that on the one hand, dependence on migration had emerged in Estonia and the country needed immigrants, and on the other hand, the problems relating to integration were very large. He suggested as a solution that it was high time to implement active migration policy, and to replace the annual migration quota and wage requirement by a point system that would take into account both the need of employers for workers and the capacity for integration of the immigrants. Professor of Tallinn University Ellu Saar said that the national segregation of labour market actually hindered the integration of society significantly, first of all because the people of different nationalities did not act together. Saar pointed out perceivable inequality as a problem that accompanied segregation. She referred to the integration monitoring data, according to which only a third of the people of another nationality felt that their possibilities in the private sector were equal with those of the Estonians. The number of those who feel that they have equal possibilities to achieve leading positions in local governments or state bodies is even less. 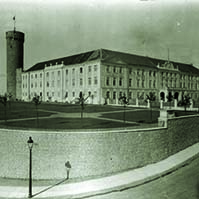 Saar also was of the opinion that segregation is very strongly connected with the division according to nationality and language in the Estonian education system. Saar also mentioned that the number of Estonians was greater in white collar positions, but the Estonian Russians was significantly greater in the jobs of unskilled workers. She also pointed out regarding the Russians in Estonia that many of those who had higher education did not work in a position where it was required. “This shows that we are not able to use all this potential in the Estonian labour market,” Saar said. 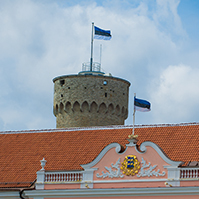 In Saar’s opinion, the aim is to ensure the Russians of Estonia access to the activities that are advantageous to them, including in the public sector. The possibilities for entering the labour market should be more flexible, like transitional period for improving the Estonian skills in the course of work and also providing language support. Member of the Constitutional Committee Mart Nutt said that if the present situation continued, it would lead to the Russian-speaking population not being successful on the labour market, and preserving the Russian school system would do them a disservice. In his opinion, a choice has to be made between the policy of assimilation and the policy of integration. Speaking of the need to mitigate shortage of labour force, Nutt admitted that as the economy developed in cycles, the shortage of labour force and unemployment alternated. He thinks that mitigating of labour shortage by bringing in labour force should not feed later unemployment. In solving the problems caused by shortage of labour force, all possibilities should be used: maximum use of Estonia’s own resources, including employing of the aged and handicapped people, widening the possibilities for retraining, promoting the return of people to Estonia, developing of technology to replace labour force. In Nutt’s opinion, migration and integration are two sides of the same medal. “To a great extent, the problems of the countries of Europe are the result of migration taking place more rapidly than integration, this has given rise to parallel societies and ghettos, where the people are separated both socially and culturally, and which have become a constant source of tension,” he said. Nutt admitted that parallel society existed also in Estonia. “I believe that in today’s situation it can be overcome easily, when the classification of people by language in kindergartens, schools and at workplaces will be overcome,” he hoped. Nutt said that language immersion, joint kindergartens and schools, and several other measures were the ways for overcoming parallel society. “If we do not pay enough attention to these problems, then we will have to face the fact that the parallel society is deepening and migration is feeding it,” Nutt said in conclusion. Yoko Alender, who spoke on behalf of the Estonian Reform Party Faction, said that Estonia would last as long as children were born here, as long as each child counted, as long as we were able to create equal possibilities for all children to develop and be happy. In her opinion, it is also important to shape migration policies and implement them successfully, and to make Estonia larger than our physical boundaries. Helmen Kütt spoke on behalf of the Social Democratic Party Faction. She pointed out the growth of welfare and reducing of inequality as problems. 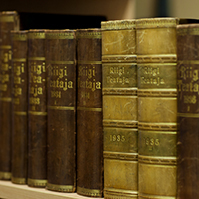 In Kütt’s opinion, the key issues of the development of Estonia are connected with education and health care. “The people of Estonia believe in education. We should be ready to provide possibilities for lifelong learning to people of all ages,” Kütt said, and added that the state should also ensure more sustainable financing of education. Mart Helme took the floor on behalf of the Estonian Conservative People’s Party Faction. In his opinion, we are dealing with the same issues that we dealt with 25 years ago. He stated that the Estonian language was under pressure like 25 years ago. Helme considered it disturbing that nationality was not spoken about any more, and that the phrase “people of Estonia” was used instead of “Estonians”. He expressed dissatisfaction that population was spoken of. “We are not population, we are not labour force and statistical units. We are Estonians,” he said. Priit Sibul, who took the floor on behalf of the Pro Patria and Res Publica Union Faction, made a proposal that the discussion of migration issues in the Riigikogu should be regular, so that all information relating to migration would be public, and that people with high qualifications should be preferred in immigration. Krista Aru, who spoke on behalf of the Estonian Free Party Faction, said that the topic of parallel societies which could be regulated through the education systems had prevailed in the discussion. Aru thought that in 25 years, economic success had been highlighted in Estonia and humans had remained in the background. Märt Sults took the floor on behalf of the Estonian Centre Party Faction and spoke of the positive effect of language immersion. Hanno Pevkur, Deniss Boroditš, Urmas Kruuse, Maris Lauri, Andres Herkel, Laine Randjärv, Henn Põlluaas and Igor Gräzin also took the floor during the debate. 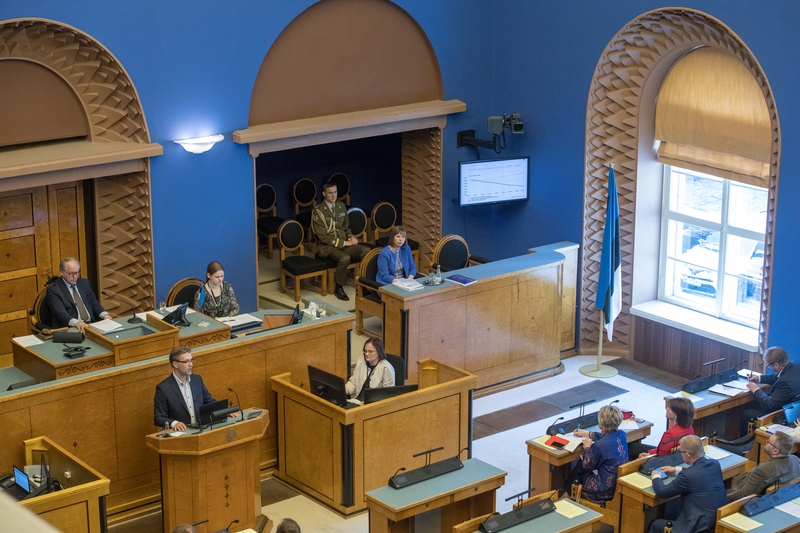 As the second item on the agenda, vote of no confidence against Minister of Finance Sven Sester, which was initiated by 45 members of the Riigikogu, was discussed at the sitting. With 42 votes in favour and 52 votes against, the expression of no confidence against the Minister of Finance was not supported. Representatives of factions who took the floor during the debate presented their positions on the expression of no confidence. Jürgen Ligi (Reform Party) gave examples supporting the criticism in the expression of no confidence and called on supporting it. Kalvi Kõva (Social Democratic Party) supported the continuing of the Minister of Finance, and explained that the Minister was carrying out the policy of the government coalition. 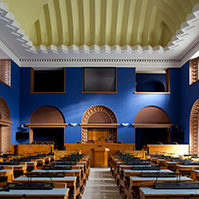 Martin Helme (Estonian Conservative People’s Party) did not support the monetary policy of the incumbent government and the continuing of the Minister of Finance in office. Mihhail Stalnuhhin (Centre Party) explained the monetary policy of the government coalition and supported the Minister of Finance. Priit Sibul (Pro Patria and Res Publica Union) supported the Minister of Finance and explained that the Minister of Finance was searching for solutions to the problems that had emerged. Andres Ammas (Free Party) said that Sester had managed to create a massive opposition of entrepreneurs. In his opinion, there is no long-term financial strategy. Therefore it was not possible to support the Minister of Finance. The sitting ended at 2.54 p.m.